South Florida has its recreational perks because of the warmer temperatures year-round. This means that kayaking fans get to enjoy a trip out on local waters no matter the season. 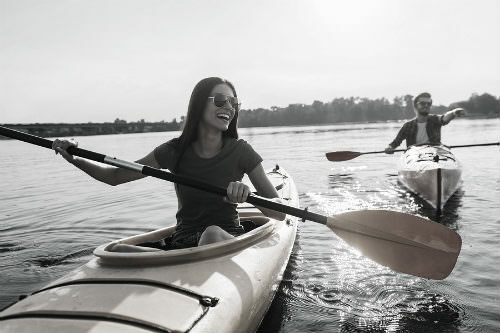 If you already know your way around with a paddle, you can find self-guided tours through kayaking the Village Creek Landing and Hampton River Marina waterways. Get a glimpse of some gorgeous scenery and history along the way. St. Simons also offers a kayak fishing tour, for the less conventional fisherman! If you are a fan of nature immersion and self-exploration, you should check out the public kayaking access locations in the Tidelands Nature Center Boat Launch. Explore Jekyll Creek or the Jekyll Island Club coast. For a shorter trip, you can always paddle to Jekyll Point instead! Waterway access is a bit more private along the Sea Island waterway, with much of this coastline reserved by the resorts in this area, including The Cloister, The Inn at Sea Island and The Lodge at Sea Island Golf Club. You can book a tour or rental option in one of these locations though—including a kayaking and beachside horseback riding package! For visitors and new residents, there’s a wide range of kayak adventuring available. It’s all a matter of how remote you want to be, and what new lands you wish to explore. If you’re also a new or potential resident looking into Sea Island real estate, contact DeLoach Sotheby’s International Realty today to learn more about their current offerings!